1. The Back of the piano is standing to the left. The keybed with keys removed, is resting on its front edge to the right. The gold painted metal frame is the cast iron plate, which withstands the 12 ton tension of the wire strings. The flat, light-colored wood panel behind the plate is the soundboard, which converts the vibrations of the strings to sound. 2. The rear view of the piano as it is being clamped, waiting for the glue to cure overnight. The diagonal wood strips on the back of the soundboard are called "ribs". They keep the soundboard ridgid, and help support the pressure of the strings. If the ribs separate from the soundboard, buzzing usually results, sometimes only for certain notes at certain volumes. 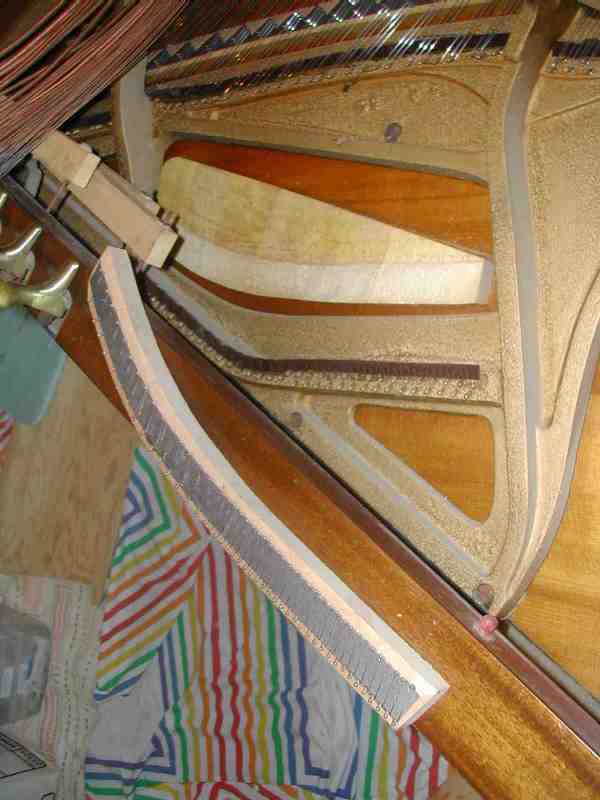 Rib repair is relatively easy, and common in older pianos. 3. Back together, tuned, regulated, and polished. 4. 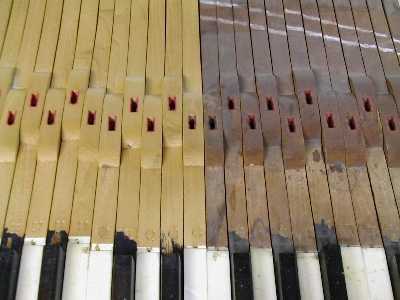 Keys from an older upright piano, showing the condition before and after gentle cleaning in an abrasive blasting cabinet. These keys later had new white keytops applied, new bushing cloth installed, and brass capstans polished. They now look and play like new keys, providing a solid foundation for all other action adjustments. 5. Here is a bridge from the bass section of a piano, resting on the bottom board of the case next to the pedals. The copper-wound bass strings have been removed and are visible at the upper left. 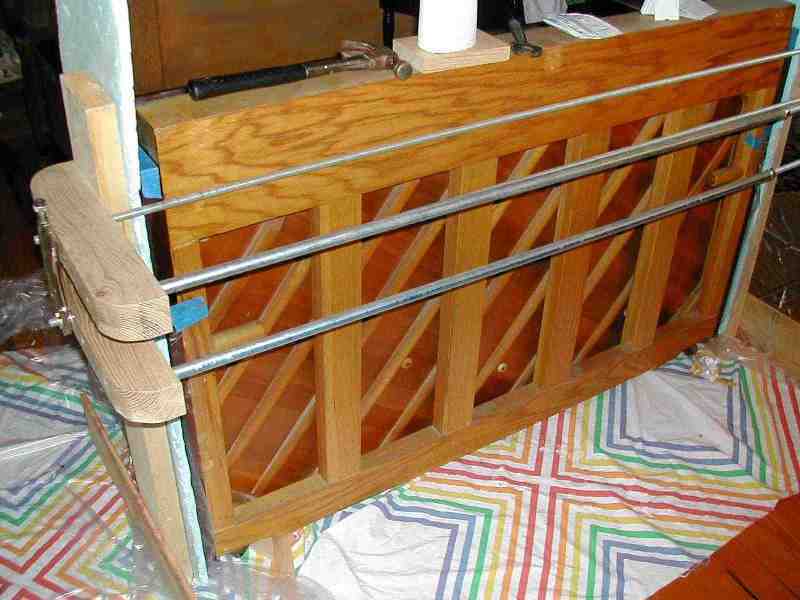 The glue joint failed between the bridge and the light-colored "shelf", which connects the bridge to the soundboard. This piano sounded very dead in the bass, with an ugly buzz on several notes, sounding something like a honking goose. The repair restored a strong, full bass to this 40 year old piano, now in use by the family's third generation of piano students. Did you ever see a piano in pieces? 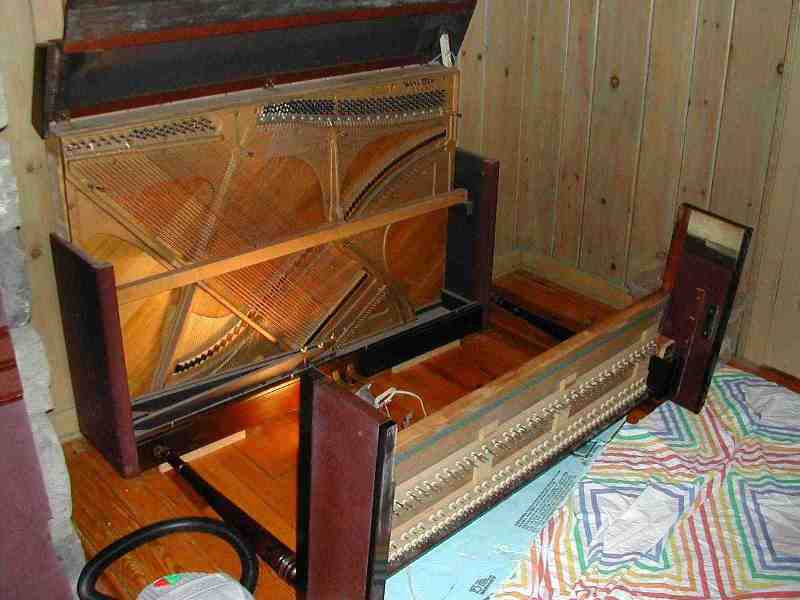 Photos 1, 2, and 3: This piano's top section separated at a failed glue joint, and the owners thought it would have to go to the landfill. With proper preparation, repair, action regulation, and tuning, it was back to playable condition in two days. The first step in any major repair is an evaluation of the piano's potential as a musical instrument assuming repairs were made. For example, it may be a bad investment to do a cosmetic restoration if the "guts" are beyond repair. 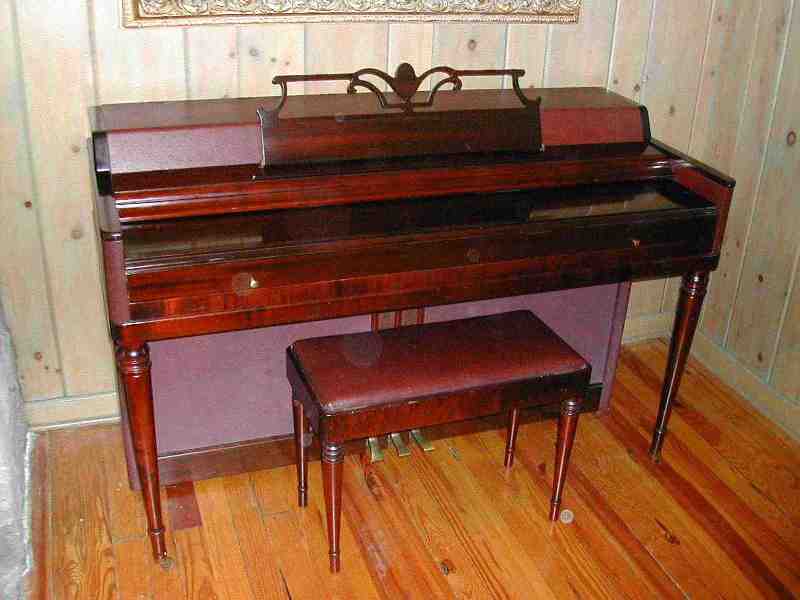 This piano happened to be in excellent condition, other than the structural failure which was limited to two glue joints. If the tuning pins had been loose, the strings rusty, and/or the soundboard and bridges cracked and buzzing, I would have suggested purchase of a healthier used piano instead of spending a similar amount of money fixing this one. Happily, this piano was saved to play another day.